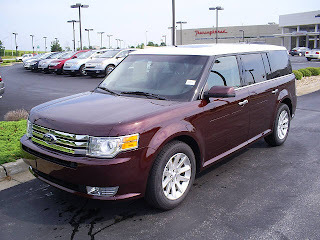 We now have 6 Ford Flex's available. We have them in all three levels, the SE, SEL and the LTD. We have front wheel drive and All Wheel Drive. We have them with second row bench seats and with Captain's Chairs and we have them with and withou the cooler already installed. We have taken a coupld of the Flex's and pictured them up on our site Thoroughbredford.com . This is a great car with great reviews.